Welcome to 5W's blog of the week! This week has been very exciting, not only in 5W's class but throughout the entire school. All because it has been The Great Westfield Bake off. The class has been cake crazy this week. We baked cakes, we decorated cakes, we sold cakes and we have eaten cakes! Surprised we are not sick of cakes! As our topic this term in science has been the life cycle of living things, we thought our cake should be related to our topic. 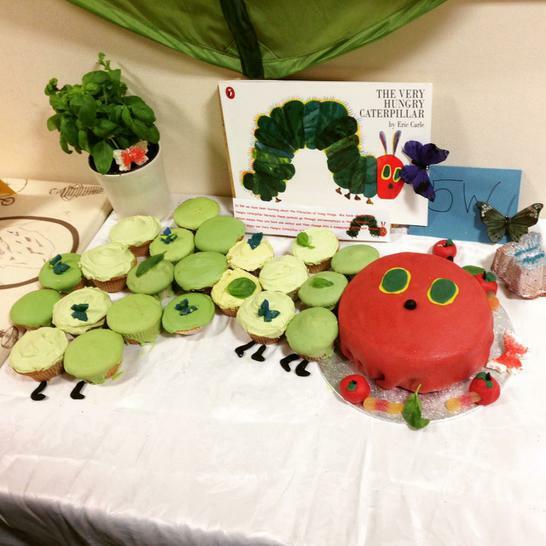 So we made...The Very Hungry Caterpillar cupcakes, and the children know exactly what goes into them as they wrote a recipe, so they could even make them at home too! The winners of the bake off were 6F and it was well deserved! They made a World War 2 inspired cake and it really was a show stopper. Well done to our class baker, Cobilee for her Westfield logo inspired cake. In maths this week we have been using all the knowledge we have gained over the past half term to answer word related questions. We have used subtraction and addition to help us to work out the answers and some of us even did multiplication and division questions. We looked at one step problems and then moved onto looking at two step problems. Have a go at this game and test how good you are at maths word problems. Another week in English and another week of lots of writing! We started the week by looking at non-chronological reports and the features of these kind of reports. We learnt that these type of reports are factual and tell the reader lots of important information, and they do not need to be written in any specific time order. We then began to plan our own, based on our topic 'Woodlands and Wetlands'. At the end of the week we wrote our very own non-chronological reports.The children proved that they have learned a lot over the past 8 weeks and remembered lots of interesting facts related to our topic. The children completed a review of their woodlands and wetlands topic. They included things that they have learned during this half term and the things that they have enjoyed doing. We have also finished off painting our water colour pictures, which look amazing! The children have continued their study of lifecycles of living things. This week they looked at the life cycle of the bat (which is a mammal). They played a real fun game in class all about bats and learned some really cool facts about this animal. Did you know that an adult bat weighs the same as a £1 coin!? We also have a new member to our class this week, Katryna. She is our certificate winner this week, as she has settled in so well into 5W. I'm impressed with how well 5W have welcomed her into the class and made her feel like part of the team already, thankyou guys! Well, I hope you all have a fabulous week away! Get lots of rest as there will be loads of work to do when we come back :) stay safe and don't eat too many sweets on Halloween! See you all on Monday 2nd November.